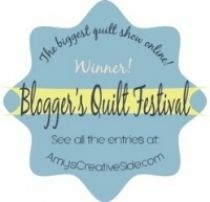 My Quilt Infatuation: Label Obsession and a Giveaway! Y'all know I am a true believer in labeling your quilts. I think it is very important to sign your work, and although I love the labels that I make by hand, sometimes I'm in a hurry and want to skip the step of making the label, and frankly, sometimes I really want labels that look more professional. 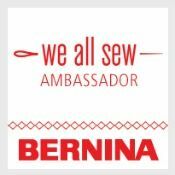 So, check out my brand new labels, and keep reading to find out how you can win a whole spool- that's 1000!- custom designed labels for yourself. I love them sooo much! I really had a hard time finding labels that I could have printed in color that were not prohibitively expensive. I found my labels at FinerRibbon, and I'm so glad I stumbled across their site! I was even able to put care symbols on the back! 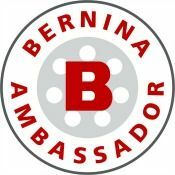 I sent them my logo, and let them know what I wanted on my label, and their company worked with me to make sure I was pleased. They sent me a proof that was perfectly to scale, so I was able to print, cut, and fold it to make sure it was exactly the way I wanted it before printing. And even though I changed my mind a few times on the layout of my label, they really were awesome to work with and never lost patience with me. When my giant spool of 1000 full-color, fully washable labels arrived, I was positively giddy. I let Peter from FinerRibbon know that I loved them and couldn't wait to let my readers know how awesome they were, and how easy they were to use. Just cut along the preprinted cutting lines, fold, and sew into the binding on the back of your quilt! 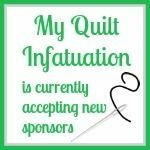 It was then that Peter asked about whether other quilters might be interested in professional, custom quilt labels and ribbon, and asked about sponsorship. I let him know that I thought that surely others would appreciate adding this professional touch to their quilts. My experience with FinerRibbon was so amazing, and I am proud to introduce them as my newest sponsor! Free digital sample approval process after your purchase- This was important for me, because you know your labels will be exactly what you want! I just cannot say enough positive things about my new labels, as well as the impeccable customer service I received from FinerRibbon. 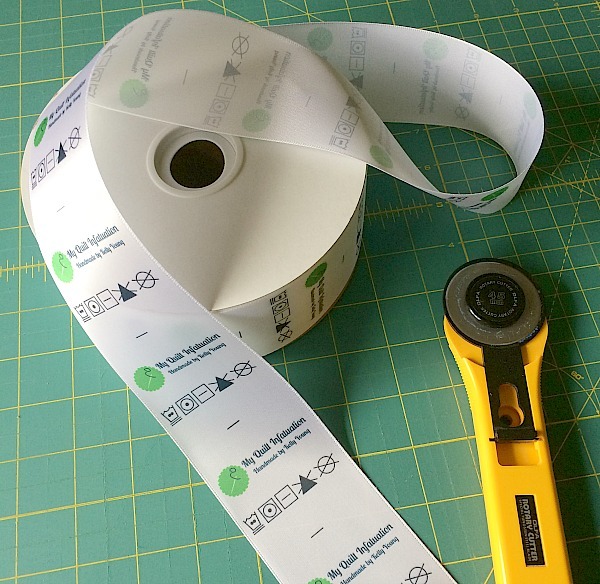 To kickoff their sponsorship, FinerRibbon is generously offering a spool of custom-designed labels to one lucky reader, in any size up to 1.5 inches, in any design you choose. My labels are 2.25 inches, so the giveaway is a size smaller, but still big enough to make a super cute, professional-looking tag. All you need to do to enter is leave a comment here! Mr. Random will help me choose a winner on Sunday evening, 7/12. Good luck to all, and be sure to pop over and check them out! Well Kelly, you have inspired me to label my quilts for the last couple of years, so why not get some labels too. It is good timing since I just had my daughter design me my own logo. Thanks for the chance! Love those, they look great! I'm intrigued. I use a different label now, but it isn't very durable. This ribbon looks amazing! Kelly, I really hope you will share what these look like after washing. I love these and this style is what I've been looking for also. I have some that washed up wrinkled and crappy. Another kind I love but they are not the fold over and sew into the edge like this. Thanks for sharing your great find and wonderful looking labels! Ive been searching for labels! Thanks for the info. I have been wanting to purchase labels for awhile now. I'll check out their site. WOW - YOUR RIBBONS LOOK AWESOME!! They are so professional looking!! and something I have been drooling over for a long while!! Way to go! Wow! Lovely labels! Thank you for the chance to win this generous giveaway. Those are some awesome labels! I'd love to be able to put a label on my projects! They are lovely! I'm about out of my current batch of labels, so some new ones would be wonderful! Kelly, you must be a mind reader. I was just looking at labels in Joann and decided I didn't them preprinted that needed me to write my name on. I also am shy about using my printer for fabric. So I will definitely check out the link you provided. I have just barely begun to quilt, but I do want labels to add to other projects I am currently making. Thank you so much for post today. Hopefully you will call my name after saying Winner! Winner! Chicken Dinner!! Ahh, these are perfect! I need to order labels and I'd love to try them. Thanks for the giveaway! Love these labels.They might also work well on some clothing. They look amazing, thanks for the giveaway! I love your labels! What a great idea! These look perfect! It's great to be able to label quilts quickly if you need to. Thanks for the chance! Those labels are exactly what I have been looking for. I will go check then out. Thank you for the chance to win some!! Ooh! I've been trying to decide if I want to start labeling my quilts. These look fantastic! Thanks for pointing us to this site! Your labels look so great! I would love a chance to try these out. Thanks to you and to Finer Ribbon for hosting this giveaway! What a great new find! Would love to jump start my business with them! Thank you! I always forget about labeling my quilts until I've finished them! Having some on hand would definitely help in breaking that bad habit. Lol. Thanks for the giveaway! I have yet to label a quilt, though I keep meaning to do it! Thanks for the giveaway! What a great find! It would be a joy to win a spool. Thanks for the giveaway. These are wonderful, especially with the washing instructions on the backside. 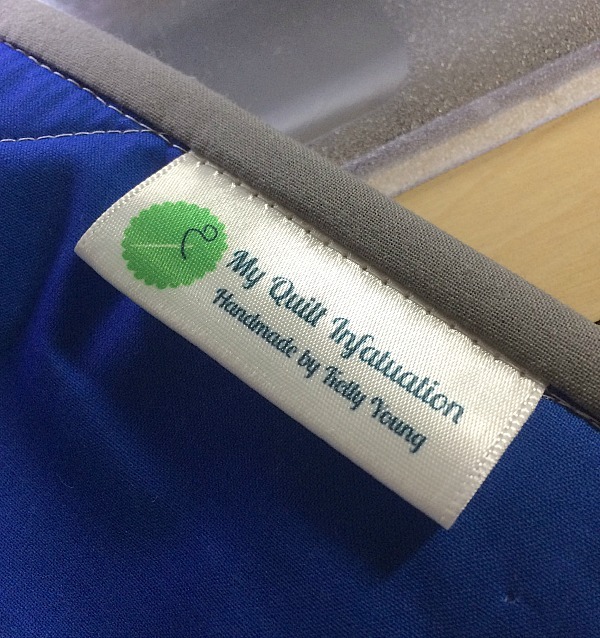 It's nice to have an option for quilts that you don't necessarily need the personal touch label for. Thanks for introducing us to this great idea! Happy summer sewing and thanks for the giveaway! Thanks for the info, and the giveaway! They look wonderful. I've searched several times for good quality (affordable) labels and I just get lost in the maze. I'll go check out their site! Love those labels. I could use them for my sewing projects. Your custom label is awesome!! I never thought to do something like this but it would be really cool!!! Thanks for a great giveaway idea!!! I've been looking for something small like this for my quilts. I will be checking them out! How Thrilling!! Your labels look amazing, I'd love the chance to win some! Those are just the thing I wish I had for my quilts, but could I use up 1000 in my lifetime? LOL!! Maybe if I win some!! Your labels look great ! Thanks for the chance to win. I desperately need some cute labels! I wasn't aware of this company before but I'm off to check them out. I would love to win this giveaway, thanks for the chance! I have been looking to get some labels for awhile. I like handmade labels for gifts, but these do look more professional for donations or custom orders. Is the size listed the width or the height before folding. Thanks for the chance to win some labels Kelly! Your labels look awesome! Thanks so much for sharing this! Creating labels has been on the list to do and this just might be the incentive to get to it! Wow, these are really cool! I love the idea of adding a label to my quilts, but have never tried it. These are amazing. I can see why you love them. But it would really help to know how much they cost. These are so cute, thanks for the chance to win! Thanks so much for the post! I have been making mine and think these labels would save me time and look just as nice! I like the care icons on the flip side too! Love to win a roll! Thank you for the source! I have put off labeling my quilts, ordering some seemed so cost prohibitive! I really would love to win! Wow, your labels look great! I would love to have custom labels for my quilting projects. Thanks! Those look really nice! I love that they come on a roll, so you don't have to worry about fraying. Oooh my gosh!! What a Super Give-a-way!! These are soooo Awesome! Thank you fior chance to win some!! Love how professional your labels look! I have been looking for some and will definitely check these out! Your labels look fantastic - I love the care directions on the back. I've been thinking of getting some labels made up, these look like a perfect option! These are awesome and look so easy to add! Thanks for the giveaway! I've been going GaGa over your quilts all day. Reading and rereading your posts and the information you provide. Funny this afternoon when I refreshed, I saw today's post about the labels. 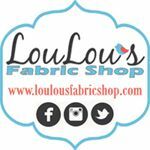 I've been looking for labels for many of the items I've sewn. I know now who the first company is I'm going to inquire with. I love your labels. 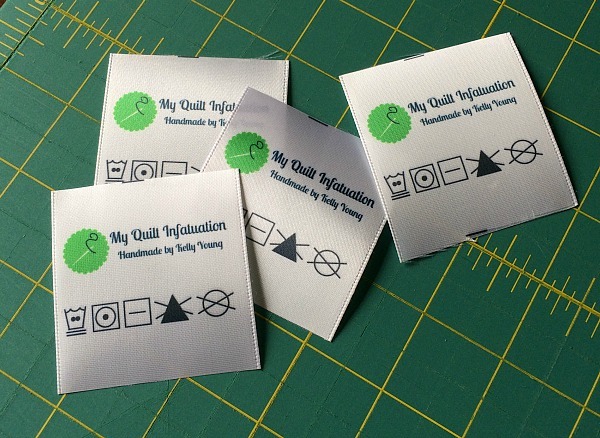 I do like the idea of having ready made labels for my quilts, I think I'd label a lot more! I'm off to check out their labels now. I am bad about labeling quilts. This would help so much. This would make me very very happy, I have wanted some labels for a long time. I would love to win such professional looking labels. Maybe it would help me to always use a label. I'm a nut that hand embroiders her labels. I am definitely interested in this option. Thanks! I am definitely going to check this company out! With your rave review, that's all I need to place an order. I do have some already that I need to use up first, and I'm not all that happy with them. Live and learn. I love yours! I'd love to love mine too! These are fabulous! I love to label all of my handmade goodies with something special, so these would be put to great use! Thanks for the chance! Those look awesome and I could definitely use some labels. Thanks for finding this great company for labels! Those labels look great...thanks for the chance to win! Very nice looking. I started making labels like this last year to make it quicker/easier to label finishes like purses, bags, and bill folds. It would be wonderful to have a spool like that to make the job easier, and more professional looking. Thanks for the giveaway chance. These are SO awesome. I would love to try those on my quilts and little zipper bags, etc. Thanks for the chance to win. What a wonderful idea. I like the backside as well. Very professional! I can see why you were pleased! I love custom-designed and custom-made professional looking labels! These look fab. I would love something like this for my handmade makes. Fingers crossed! I have planned to do this so many times. Nice labels! Very cool! Somethng I've looked at getting something like this too. Great idea! They look great! Thanks for the chance!! Your labels look great. And to have it all ready to go would be such a timesaver. Great idea to put the care instructions on the back too. These labels are wonderful. 999 more quilts to make! A very professional touch to your work. Thanks for bringing the company to your readers" attention. Love these labels! Thanks for the chance! They look so nice. Thank you for the giveaway. A great label size especially for baby quilts or commissioned work! Kelly, your labels are so cute! I want some, too, and hope I win. I've been thinking about purchasing labels for a while but am a bit lost as to where to start. Thanks for the info on your labels and for the chance to win. I will definitely check out your new sponsor - congratulations! LOVE your labels, and would love some for my quilts! Your labels are great! I need to label my quilt tops and bags. Those labels are like the frosting on the cake! These look fantastic. I have some small labels, but they are too small for quilts really and don't fold in half. These look much more durable. great idea for labels I want some!! For sure I would now label my quilts, if I had these! Thank you! Oh boy, the labels are awesome! Thanks for the opportunity to win! Those labels are perfect! I can't tell you how many times I didn't put a label on a quilt because I was tired and ready to be finished with my project. Thanks! Thank you for a great giveaway! Professional labels for my quilts would be wonderful! Love the labels. Would love to win . Who knew such a thing even existed! They are wonderful. I'm ashamed to say that I have never labeled one of my quilts. These would certainly help. They look fabulous!!! Thanks for showing and now I know where to get!! Labels are one of my least favorite parts of quilting but one of the most important. I would love to win a spool of my very own!!! Labels with washing instructions are a fantastic idea! I've pinned the name of the company for the future. Thank you for the contest. I have always admired your labels Kelly, but these do add a professional finish, and look great with your logo. I am also interested in their crossgrain options. Congrats on the new sponsor! Love your labels. I keep thinking I must get some as it gives that 'finished' look. Thanks for the giveaway. Wonderful source - thanks for sharing! I agree with you about labeling quilts. It is the last thing I do when a finish a quilt and it makes me feel proud and ready to give the quilt away. Yes, I agree. I really could use new labels. I'm almost out of my last label. I like this design more. They look great. And with care symbols on the back!!! Thanks for the giveaway. I have been wanting labels for my projects for years now! I would love to have some of these!! So clever! My least favorite part of making a quilt is making the label! Your new labels are terrific! It sure would be fun to have some of my own! Thanks for sharing the information. sometime the hardest part of finishing a quilt is making the label; this would make it so easy. thanks for the giveaway. I've been wanting to order labels for so long...maybe the day has come! Thanks for your post! I love this idea! I think the smaller size is perfect for both quilts and bags! Thanks for introducing us to a great source! I've been searching for a good label, and love how yours turned out! Thanks for this great giveaway! Oh,they are very nice. Thank you for the chance to win! These are such beautiful labels. The perfect completion for handmade articles! Love this idea. After I comment here, I'm heading over to check on their prices. Knitters have been doing labels similar to this for years. 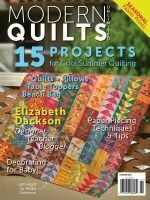 Why not quilters too? Love the idea and will be ordering some of these! The labels are great and the price incredible! I do like the way they fit in the binding, and washing instructions are a very good addition. I don't know if I'll ever get 1000 quilts made but I would love a roll of these labels, who wouldn't! Such neat labels. It makes me want to design a logo. Laundry instructions on the back, that's very clever and such a necessity for gifting. Your's are the first I've seen like that (or maybe I just wasn't looking at the backs?). Thanks for this very useful giveaway. Oh, my goodness! These labels would be AMAZING to win! I have never labeled any of my quilts because I do not feel the handwritten labels look professional enough. This is the perfect solution for me! Sweet, Kelly, it was you who convinced me that labeling was super important. I looked a couple years ago for labels and was unable at that time to find any that I really liked. You have found what may be the newest member of LyndaLand's team. Thanks so much. Those look really nice. I've been meaning to pull the trigger on custom made labels but just haven't done it yet. Will definitely check out this company as well. Love your labels! Thanks for the giveaway! I'd love to have some of my own! These look great. What an awesome giveaway! This is a good idea and makes a great looking label. I could really use them. Thanks for the chance to win. I enjoy reading your blog. love to have these. So professional! Thank you for the chance to win some. This is such a great post. I have searched online numerous times for pre-made labels that I felt were attractive, customizable and affordable. I have given up over and over again. Thanks so much for the resource and the chance to win! Really enjoyed learning about Finer Ribbon labels. Would love to win some of my very own. Thank you! These look great! Thanks for sharing your experience - nothing beats first hand experience. I will definitely order these. Those look great. I ordered some from another comany and when I got them the font was barely legible. So tiny. I am excited to try these!! Those look great! I'd love to get some like this for my business, as soon as I come up with a logo! Oh my gosh…those labels are awesome! I have been looking and looking for a place that would make labels for me that didn't look tacky and yours fit the bill! Your labels look fantastic! Thanks for the chance to win! Yes,Yes,I'd love to win. I'll be thinking on my color label right up until Mr Random chooses me!! rjc2cam(at)gmail(dot)com thanks for the chance to win. Oh my gosh yes! I've never labelled any of my quilts before because by the time I get to the binding I'm usually in such a hurry to finish it and see it come out of the dryer all lovely and crinkled I skip that step. Love them! I've been thinking about labels that would work for quilts and clothing, this could be it. Your labels look great! 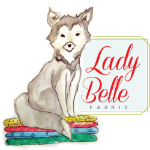 I've been contemplating having labels made with my logo so I'll check out Finer Ribbon's site. 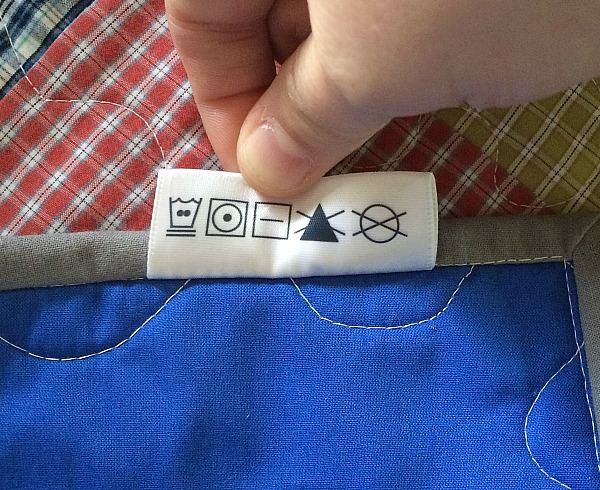 Love the laundry symbols you used on the back too. But I will have to look them up. I think it means machine wash and/or dry and also line dry is okay but not dry clean or sunshine? but I'm not sure. 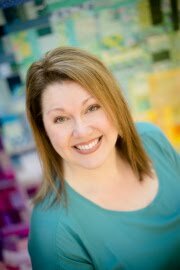 Love how professional all of your ideas are, you are a top notch quilter in my book. Your labels look fantastic. I would love the chance to create a label of my own. It is also wonderful to hear you have found a company who are patient and helpful. I will post their website address as well on all my media sites. My friends and I have been talking about professional labels for awhile. Now we have the place to get them. Thank you. Oh Goody! I have finished my first 2 quilts, have one waiting to be quilted and another to sandwich, etc and two more tops planned out and hopefully done before summer break is finished. I've been trying to decide how to label these. The first two, I hand embroidered on because I didn't know what else to do. Since then, I've been investigating my options and have just decided to purchase a preprinted label. I'll have to check this company out! :) Thanks Kelli! Gosh, I never thought about this kind of label before. I usually make labels for my quilts using a compact disc as a pattern so I can include more info about the quilt. But I have a logo for firstlightdesigns.com and would love to see it on a professionally printed label. Must investigate! these look great! i really need to start labeling my quilts. I checked out Finer Ribbon and I am impressed. I really like how you are able to include care instructions on your personalized label. 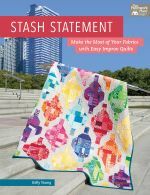 Including care instructions is so important for any quilted or sewn project that leaves your home. Thanks for offering this awesome giveaway. I'm so bad about labels. I can't decide whether to use small ones like you have sewn into the binding or larger ones that can be pieced into the back with room to write in the quilt's name date etc. So instead I do nothing most of the time. Not good. I like the labels, but we need special ones for our Quilts of Valor. Maybe I could use them for my family/personal quilts, though.